Precisely 21 years ago on this day, the 8th of May, a devilishly cute, big-brown-eyed baby boy was born in a small town on the outskirts of Boston Massachusetts. 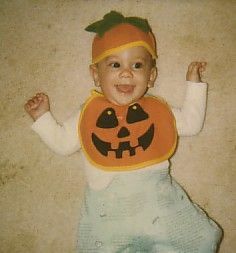 Yup, this is me at my 1st halloween. I know, I know…so darn cute! While the 21st birthday is usually a cause for concern, I have yet to partake in my first [legal] alcoholic beverage so you can rest assured that this post will not be full of incoherent jibber-jabber. On the contrary, this article means a great deal to me. While I have written bits and pieces about myself in the past, I’ve yet to appreciably express who I am, what I’ve done, or where I see myself going, both in regard to fitness and life in general, in the future. In writing this piece I not only want to share more about myself and who I am as a coach and individual, but in the process I hope to learn more about myself and what I truly aim to accomplish in all aspects of life. Before I begin I would like to say that I am an extraordinarily fortunate young man and couldn’t possibly express how deeply I appreciate my family, friends, mentors, colleagues, and all of the incredible experiences I’ve been a part of thus far. If it weren’t for the unconditional love, generosity, and sacrifices of countless individuals, I most certainly would not be the happy, optimistic, and confident person I am today. While I can’t individually thank everyone in this lone post, I want each of them to know that they have and continue to teach and inspire me on a daily basis. I hope you enjoy getting to know me a little bit better, and perhaps after reading this you’ll feel comfortable enough to tell me a little something about yourself. I grew up in a quaint, small, and beautiful town about 45 minutes outside of Boston. While at the time I didn’t give it the appreciation it deserved, my hometown provided me with an enormous variety of opportunities and an unbelievably great education. Only a lucky few grow up in towns like these, and I was fortunate enough to be one of them. As I grew older I became progressively more and more interested in training and nutrition. Among other sports, I wrestled my entire life and began seriously weight training at 14 years of age. I tried every training method under the sun and battled some very unhealthy relationships with food, most of which you can read about here. Unlike most high school students, I was privileged enough to have access to a gym, not only outfitted with top-of-the-line equipment, but two of the best mentors a kid could ask for. My wrestling coach, Taylor, and my Phys Ed instructor, Shawn, were both extraordinarily generous and, in addition to teaching me the basic fundamentals of strength and conditioning, they forced me to think like a coach. Because of their encouragement, by 15 years of age I was writing my own training programs, tracking my progress, and thoroughly focused on improving athletic performance. Thank you, Shawn and Taylor. I applied for my first job as a personal trainer when I was 17 years old. I vividly remember myself, breathless with anticipation, as I drafted an e-mail to the gym’s head trainer asking for a possible desk job in return for learning how to properly train using the Kettlebell. As luck would have it, I not only got the job but also happened to be working under two of the smartest and most generous individuals I’ve ever met – Stacey Schadeler and Kevin McCarthy. In addition to spending extra hours teaching me how to use the Kettlebell, they also took it upon themselves to instruct me in various aspects of strength training such as technique points/cueing, program design, client individualization, and perhaps most notably the importance of reading and a life-long education. By the time I was 18 years old I was running bootcamps, leading small-group training sessions, and writing individualized training routines for 1 on 1 clientele (always with Kevin and Stacey’s approval). In fact, and it seems crazy to me now, I’ll never forget leading a 68 year old man, Fred was his name, through his 60 minute training session on more than one occasion. Because of Kevin and Stacey’s patience, knowledge, and expertise, I began to accumulate my 10,000 hours significantly earlier than most. Thank you, Kevin and Stacey. What came next for me was a giant’s leap away from the path of the standard American high school grad, and was bar-none the single greatest experience of my life thus far. Instead of diving right into 4+ years of higher education, I decided to take what is known as a “gap year” between high school and college and join a 9-month volunteer-based program in Israel. Despite being thrown into a completely foreign situation and having legitimately zero knowledge of the language (with the obvious exception of various words such as “Shalom,” “Matzah,” and a variety of inappropriate phrases), I arrived in Israel and immediately fell in love with the people, culture, and the endless beauty it has to offer. During my 9 months abroad I taught English to elementary-aged children, worked construction atop of the world-famous Mt. 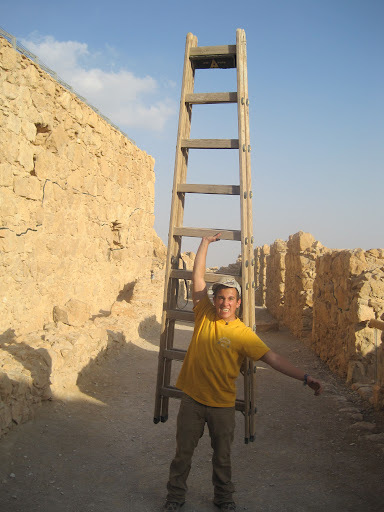 Masada, and volunteered with elderly men and women, many of whom were Holocaust survivors. I became an extraordinarily independent 18 year old as I travelled through the entire state of Israel as well as surrounding countries such as Jordan (which resulted in a rather comedic interaction between myself and the Jordanian Border Patrol regarding the validity of my first name). I became conversationally fluent in Hebrew, was randomly cast onto an Israeli Reality Television show, lived in apartments in Tel Aviv, the Negev, and Jerusalem, dated several gorgeous Israeli women, and like most 18 year-old’s, partied like a rock star. 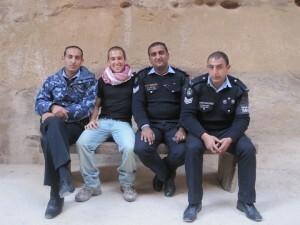 And this is me with some Jordanian Police. This is their happy face. Interestingly, despite the never-ending barrage of new and exhilarating experiences, my year abroad only reinforced my love and passion for health and fitness. Throughout the year I lived with three of the best roommates a person could ask for, each of whom became utterly fascinated with my philosophies regarding training and nutrition, and subsequently allowed me to become their “24/7 coach” and guide them through all things health related. Throughout those 9 months I spoke endlessly on the subjects of strength training and nutrition. As I was a staunch supporter of Ori Hofmekler’s The Warrior Diet and had a giant man-crush on Pavel Tsatsouline, I effectively, and somewhat comedically, turned this group of 18 year old boys into strength training and intermittent fasting extremists, regularly feasting on entire rotisserie chickens and relentlessly attempting to master the pistol squat…even whilst riding on public transportation. Me and the roomies near the beginning of the year. Yup, I’m the short one. While I often look back and cringe over the recommendations I gave my roommates, throughout the course of the year I helped my friends lose near a collective 100lbs while simultaneously gaining strength, knowledge, and confidence. I’ll never forget our last night together as we [drunkenly] reminisced over all that we had accomplished, and one by one each of my roommates thanked me and attributed their success to my lessons, patience, and encouragement. Later that night, I vividly remember making the decision to dedicate my life to helping others achieve their health and fitness goals. Thank you, Mike, Sam, and Gans. Since returning from Israel my life has been absolutely, completely and utterly, insane. A mere two days after landing in Boston I began working under Kevin, Stacey, and world renowned exercise physiologist/biomechanist, Aaron Brooks, at his facility Myoforce. After roughly one hour of work I quickly came to grips with the fact that I was an ignoramus and knew legitimately nothing about strength and conditioning. Thanks to Aaron, Kevin, and Stacey, I began to gather a basic understanding of the human anatomical structure and how the kinetic chain functions as a whole. I was able to [feebly] conceptualize how one kink in the chain could have dramatic effects elsewhere in the body, and where pain/dysfunction appears may not be (and likely isn’t) the cause or source. By the end of the summer I was leading classes, running small-group training sessions, and learning the basics of how to evaluate an individual based on their gate pattern and postural analysis. Granted, I wasn’t (and still am not) an expert, but this experience allowed me to see an essential componenent of strength and conditioning which many coaches aren’t even aware exists. Thank you, Aaron, Kevin, and Stacey. Before I knew it, several days after my final shift at Myoforce, I found myself in my freshman dorm room at The University of Delaware. While the campus couldn’t have been any more perfect, the girls couldn’t have been any more gorgeous, and the alcohol couldn’t have been any easier to obtain…for the first time in my life I felt completely alone. All around me students were “living the college dream” and having the time of their lives, while I was unable to understand why I wasn’t enjoying myself as well. For some inexplicable reason, drinking to the point of blackout and the thought of “hooking up” with random girls in the basement of a dirty frat house was no longer appealing. The only thing I had which brought me any meaningful amount of happiness was my focus on training and nutrition. I had recently become a client of Martin Berkhan’s and was soaking up as much information as possible. In addition to Martin’s program I was reading everything I could get my hands on by Martin, Lyle McDonald, Alan Aragon, and John Berardi. In regard to S&C I was heavily immersed in material by Louie Simmons, Zatsiorsky, Verkhoshansky, Eric Cressey, Pavel Tsatsouline, Dan John, Mike Robertson, and Bret Contreras. Finally, works by Eckhart Tolle, Dale Carnegie, and Tony Robbins played a major role in helping me appreciate all of the beauty the world has to offer, even during this difficult period of my life. By the end of my first semester I had completed Martin’s program and achieved an extraordinarily lean physique. 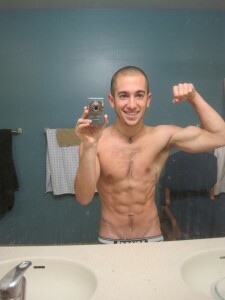 At 5ft 4in (yes, I’m astonishingly tall) I weighed in at 120lbs and was shredded to bits. While I had achieved my physique-based goals and learned a great deal in the process, I still wasn’t happy. Looking back on it, perhaps the most valuable lesson I took from my n=1 dieting experiment is that achieving a lean physique will not inherently bring joy to one’s life; an unhappy individual will remain unhappy regardless of whether they are at 12% or 6% body fat. To be happy one must enjoy, understand, and appreciate the value they bring to their own life as well as the lives of others. One evening in mid October as I exited the dining hall, I noticed I had a missed call and voicemail from an unknown number. After punching in my password and listening to the sweet lady’s voice tell me “You have…1 new voice message!” I stopped in my tracks, jaw having fallen wide open, and listened in shock as the voice of Louie Simmons introduced himself over my answering machine. I’m not sure how long I stood motionless for but I must have listened to the message 5, 6, or 7 times through without moving a muscle. After listening to it one last time, I saved it and collapsed into what likely appeared to onlookers as something akin to a rabid animal entering a hysterical epileptic fit. By some stroke of luck, Louie Simmons had offered me the opportunity to live in Ohio and train at Westside Barbell. The rest of the school year went by in a haze. I’m not sure how I did it but I managed to scrape by and pass all of my classes, co-create The University of Delaware Powerlifting Team, begin my own training business, and devote all of my free time to reading/watching every book, article, and video Louie had ever published. In what seemed like a blink, my freshman year was over and I was on the 14 hour drive from Boston to Ohio. At Westside I was [again] hit with the harsh reality that I knew legitimately nothing about strength and conditioning. It was one thing to read about Louie’s methods; it was something entirely different to experience them first hand. Louie is unquestionably the smartest and most generous man I’ve ever met. He took me under his wing and spent hours on end explaining his methodology, how to employ it, and why it’s so effective. He didn’t just teach me how to train; he taught me how to learn, coach, and experiment. Louie taught me what it takes to be strong. Not only did he teach me how to improve one’s physical strength, he also taught me how to improve mental strength, as well. While working with Louie and training at Westside I was able to see a level of strength that most people cannot fathom. 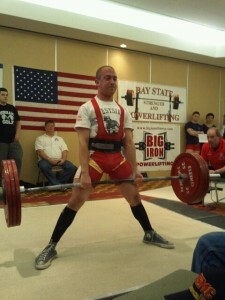 I saw men un-racking bars loaded with over 1200lbs, and I saw men bench pressing 900+lbs with apparent ease. To accomplish feats of strength such as these requires much more than just physical ability; it mandates a type of mental strength so profound that few can truly comprehend it. I’ll be the first to admit that I, in no way, shape, or form understand it – I handle mere fractions of what these men can lift – but I have seen this mental ability and it’s something special to say the least. Throughout my summer at Westside I trained a minimum of 8 times per week, added roughly 300lbs to my Squat, Bench, and Deadlift total, passed the Westside Certification Exam, and am currently a Westside Certified Special Strengths Specialist. Thank you, Louie, Doris, Janelle, Tom, and everyone else at Westside. While training at Westside, in addition to working part-time at a local Ohio gym, with the help, guidance, and support of my friend and mentor Jc Deen, I officially launched this website which rapidly turned into something far more special than I ever imagined possible. Through syattfitness.com I have been able to establish relationships with some of the brightest minds in the fitness industry, work with and help clients on an international basis, and extend my knowledge base far beyond what traditional education has ever been capable of offering me. I am exceptionally fortunate in that I have many people who truly want me to succeed, but I can honestly say this website would not be up and running if it were not for one specific individual who invested an extraordinary amount of time, effort, and trust in me from the very beginning. Most recently, this past December – February I was fortunate enough to have the opportunity to intern at Cressey Performance under Eric Cressey and Tony Gentilcore. Once again I was hit with the harsh reality that, in the grand scheme of things, I know very little in regard to strength and conditioning. While interning at Cressey Performance I experienced an aspect of coaching that goes well beyond the norm in this industry. Eric and Tony, in addition to being extraordinarily intelligent, humble, and generous with their time and knowledge, are simply masters of their craft. They have taken the best of strength training, functional movement, mental ability, and business and created one of the finest performance facilities in the world. During my time at CP I took full advantage of the knowledge around me and consistently berated Tony and Eric with question, upon question, upon question. Granted, they must have been ecstatic to see me go, but by the end of my internship I was an entirely different coach. I had learned more about the body, functional anatomy, its relationship to strength training and sport in 2 months than I had in nearly 2 years of a University level education. Thank you, Eric, Tony, Chris, Pete, and everyone else at CP. To be completely honest…I have no clue! I’m 21 years old (that’s really weird to say), I’ve written a book, started a successful business, published over 50 articles, traveled around the world, worked with some of the brightest minds in the fitness industry, and have helped numerous clients achieve and maintain their health and fitness goals. Since there’s no way of knowing exactly where I’ll go or what I’ll do next, I’ll tell you what I have planned in the immediate future as well as some possibilities for where I see myself going in the long-haul. First and foremost, this coming summer is bound to be an incredible experience as I’ll be spending 5-weeks travelling throughout The Czech Republic, Poland, and Israel. For the duration of the trip I’ll be assuming the role of guide/counselor to a group of 40 Jewish teens, and leading them in the footsteps of our ancestors to places including Auschwitz, Birkenau, Schindler’s Factory, and the Western Wall. I’m extraordinarily fortunate to have this opportunity and cannot fully express how eager I am to work with these young adults on such an educational, emotional, and thought-provoking trip. As I will quite literally be on the job 24/7, have zero gym access and be exceptionally limited in regard to available training time, over the course of the trip I expect to update this site with sample videos outlining how to effectively train with minimal equipment and time availability. Following this summer’s adventures my only definitive plan is to finish University. I have roughly 4 semesters left to complete so, assuming all goes as planned, I’ll probably be in school for another two years. While I certainly don’t love University life, I have grown to enjoy my campus and appreciate all that College has to offer. At the very least, the next 2 years will give me ample opportunity to continue coaching the UD Powerlifting Team, build upon my business, make new friends, and enjoy being a college student. As well, over the next 2 years I plan to release 1 or 2 more e-books, create some awesome SyattFitness apparel, and continue working with and expanding upon my client base. Additionally, and perhaps most excitingly, I will soon be applying for new internships with several world renowned S&C coaches; I have a couple facilities in mind, each of which which would greatly influence my abilities as a coach and an athlete, so I’ll be sure to keep everyone updated as time goes on. As for life after University…well that’s a whole different can of worms. While this is clearly subject to change, I’ve recently been thinking about joining the Israeli Defense Force (IDF) and working as a strength consultant for their special forces. Afterwards, I would like to open a small gym near Tel Aviv or Haifa and prepare local Israeli youth for their obligatory Army service. Again, none of this is definitive; it’s simply one of the many options I’ve considered over the past few years. What I do know is, apart from working in the health and fitness industry, I really want to travel. I want to go everywhere and see everything the world has to offer. I want to experience different cultures, live with them, train with them, taste their food, drink their alcohol, dance with their women, and laugh until my cheeks hurt too much. The world has so much to offer and we’re on it for such a short period of time…might as well have some fun and live life to the fullest! Before I sign off I want to extend one final “Thank you!” to all of my family, friends, mentors, colleagues, clients, and readers. Because of your support and encouragement I have been able to accomplish more than I ever thought possible. I have a lot to accomplish and whole lot more to learn, but I’m excited to share my experiences with you as I progress and grow into the man I hope to be.